Planning for your 2017 gateway? Come and join us, spend your time in Pulau Perhentian Kecil (Perhentian Island)! Pulau Perhentian, both Pulau Perhentian Kecil and Pulau Perhentian Besar, being one of the most popular island in Malaysia, surrounded with crystal clear water, filled with variety of species of underwater creatures, sandy beach, bright sun, spectacular view of sunrise and sunset, sound perfect for short break from stress of your daily duties! Grab Pulau Perhentian package 2017 offer while it lasts as the rooms offered are limited in number. Only starts from RM 300 per person you'll get to spend your time and make a great memories with your friends, family and even make new friends! Return speed boat transfer from Kuala Besut Jetty to Pulau Perhentian Kecil (Pulau Perhentian), 3 days 2 nights accommodation at Ewans Place - Pulau Perhentian Kecil, chalet with fan, attached bathroom (personal bathroom), 24 hours electricity supply, 1 fullday snorkeling trip to 5 sites in Pulau Perhentian Kecil and Pulau Perhentian Besar, full set of snorkeling equipment, 1 lunch at the Fisherman Village during your snorkeling break, underwater photography services are available upon request & at a reasonable price. Walking distance to get to the Long Beach Perhentian - Pulau Perhentian Kecil, access to private beach, 20-40 mins hiking to the windmill Pulau Perhentian Kecil. 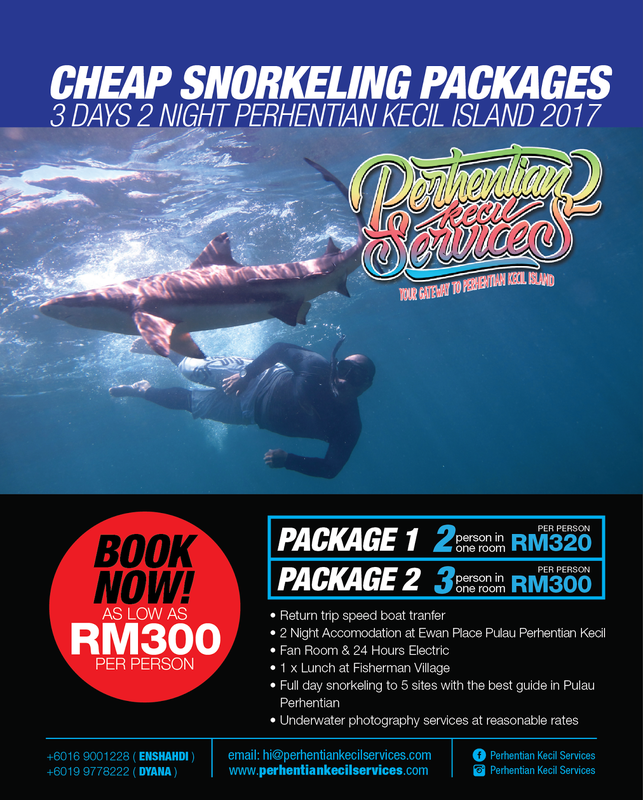 For Long Beach - Pulau Perhentian Kecil, Pulau Perhentian 2017 packages, click here. 3 days 2 nights Perhentian Island 2016 Fullboard Package. PERHENTIAN KECIL SERVICES. Powered by Blogger.